Five years ago today — on December 27, 2004 — the Earth was attacked by a cosmic blast. The scale of this onslaught is nearly impossible to exaggerate. The flood of gamma and X-rays that washed over the Earth was detected by several satellites designed to observe the high-energy skies. RHESSI, which observes the Sun, saw this blast. INTEGRAL, used to look for gamma rays from monster black holes, saw this blast. The newly-launched Swift satellite, built to detect gamma-ray bursts from across the Universe, not only saw this blast, but its detectors were completely saturated by the assault of energy… even though Swift wasn’t pointed anywhere near the direction of the burst! In other words, this flood of photons saturated Swift even though they had to pass through the walls of the satellite itself first! It gets worse. This enormous wave of fierce energy was so powerful it actually partially ionized the Earth’s upper atmosphere, and it made the Earth’s magnetic field ring like a bell. Several satellites were actually blinded by the event. So what was this thing? What could do this kind of damage? Astronomers discovered quickly just what this was, though when they figured it out they could scarcely believe it. On that day, half a decade ago, the wrath of the magnetar SGR 1806-20 was visited upon the Earth. Magnetars are neutron stars, the incredibly dense remnants of a supernovae explosions. They can have masses up to twice that of the Sun, but are so compact they may be less than 20 kilometers (12 miles) across. A single cubic centimeter of neutron star material would have a mass of 1014 grams: 100 million tons. That’s very roughly the combined mass of every single car on the United States, squeezed down into the size of a sugar cube. The surface gravity of a neutron star is therefore unimaginably strong, tens or even hundreds of billion times that of the Earth. What makes a neutron star a magnetar is its magnetic field: it may be a quadrillion (1015) times stronger than that of the Earth! That makes the magnetic field of a magnetar as big a player as the gravity. In a magnetar, the magnetic field and the crust of the star are coupled together so strongly that a change in one affects the other drastically. What happened that fateful day on SGR 1806-20 was most likely a star quake, a crack in the crust. This shook the magnetic field of the star violently, and caused an eruption of energy. The sheer amount energy generated is difficult to comprehend. Although the crust probably shifted by only a centimeter, the incredible density and gravity made that a violent event well beyond anything we mere humans have experienced. The quake itself would have registered as 32 on the Richter scale — mind you, the largest earthquake ever recorded was about 9 on that scale, and it’s a logarithmic scale. The blast of energy surged away from the magnetar, out into the galaxy. In just 200 milliseconds — a fifth of a second — the eruption gave off as much energy as the Sun does in a quarter of a million years. A fireball of matter erupted out of the star at nearly a third the speed of light, and the energy from the explosion moved — of course — at the speed of light itself. This hellish wave of energy expanded, eventually sweeping over the Earth and causing all the events described above. 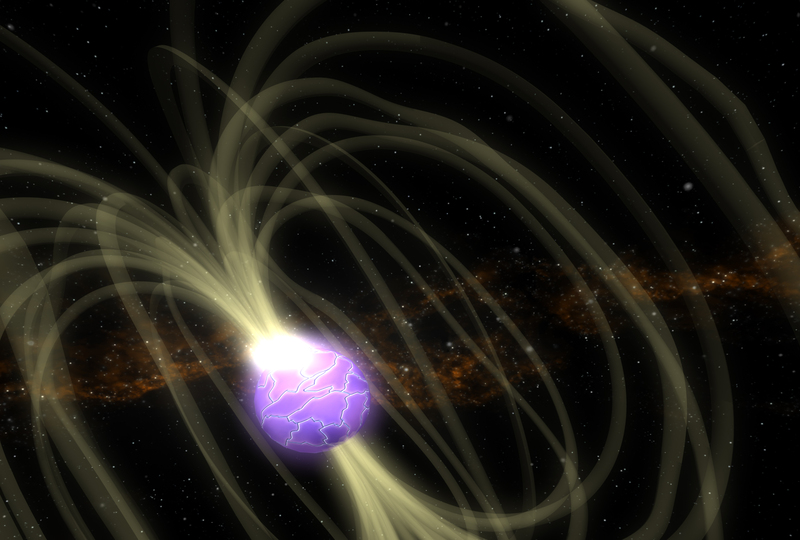 Oh, and did I mention this magnetar is 50,000 light years away? No? That’s 500 quadrillion kilometers (300 quadrillion miles) away, about halfway across the freaking Milky Way galaxy itself! And yet, even at that mind-crushing distance, it fried satellites and physically affected the Earth. It was so bright some satellites actually saw it reflected off the surface of the Moon! I’ll note that a supernova, the explosion of an entire star, has a hard time producing any physical effect on the Earth if it’s farther away than, say, 100 light years. Even a gamma-ray burst — an event so horrific it makes the hair on the back of my neck stand up just thinking about it — can only do any damage if it’s closer than 8000 light years or so. GRBs may not even be possible in our galaxy (they were common when the Universe was young, but not so much any more), which means that, for my money, magnetars may be the most dangerous beasties in the galaxy (though still unlikely to really put the hurt on us; see below). This is the light curve that [Swift’s Burst Alert Telescope] saw, showing how many gamma rays it counted in each sixteenth of a second during six minutes of observation. I didn’t draw the main spike because it was 10,000 times as bright as the tail emission, and you would need a monitor a thousand feet tall to look at it. The blast was so strong Swift saturated, counting 2.5 million photons per second slamming into it, well off the top of that graph (and the actual blast was far brighter yet, as other satellites were able to determine). See the pulsations in the plot? After the initial burst, which lasted only a fraction of a second, pulses of energy were seen from the magnetar for minutes afterward. The pulses occurred every 7.56 seconds, and that’s understood to be the rotation period of the neutron star. The crack in the crust got infernally hot, and we saw a pulse of light from it every time it spun into view. This same pulsing was seen by other satellites as well. The damage from the explosion was actually rather minimal here on Earth. But that’s because SGR 1806-20 is 50,000 light years away. Had it been one-tenth that distance, the effects would have been 100 times stronger. We’d have lost satellites at least, and it would have caused billions of dollars in damage in NASA hardware alone. Of the dozen or so known magnetars, none is that close (though a couple are about 7000 light years away). 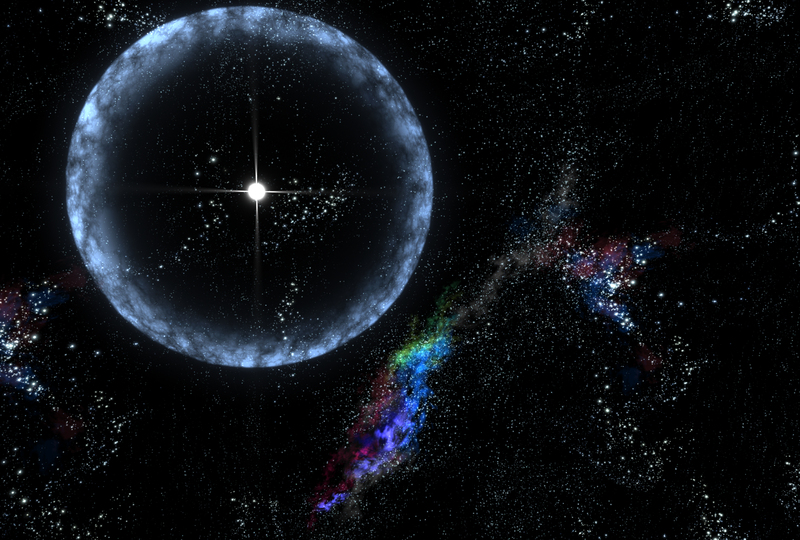 Magnetars aren’t easy to hide, but it’s possible there are some within 5000 light years. It’s unlikely, though, and I’m not personally all that concerned. I do have one thing to add: when this event occurred, I got an email from someone convinced that the magnetar was responsible for the earthquake in Indonesia that created the devastating tsunami that killed more than 250,000 people. However, there is one small problem with that idea. Well, two problems, really, the first being there’s no physical way it could have triggered an earthquake! But a worse problem is that the earthquake occurred on December 26th at 00:58 UT, and the burst from the magnetar was at December 27 at 21:30:26 UT, about 1.5 days later. Oops. But why let facts get in the way of a good pseudoscientific theory? The tantrum from SGR 1806-20 is one of the best studied events of its kind, and is certainly the most powerful ever detected in the modern era. Astronomers will be studying the magnetar, and others like it, very carefully to see what can be learned from them. If you want to read more, then I suggest the NASA page about the event, as well as the Sky and Telescope magazine page on it, too. And if another blast like that one comes from SGR 1806, or any other magnetar, don’t worry: I’ll report it right here. Unless it fries my computer. Or just my brain, reading about it.